Maybe I should clarify my comments. I was born in 1959 so I was quite young when reading about Wayne Gapp and Gapp and Roush in the late 60’s and early 70’s. 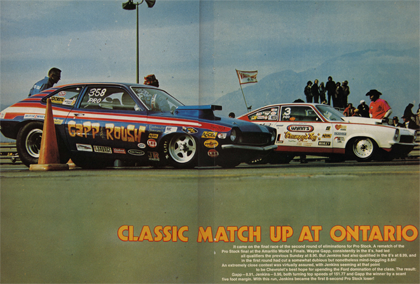 I did put together some (Revell maybe) models of Gapp and Roush drag cars. Thanks for your comments. I put together the site for a few reasons but one of them is that by the time I knew what was really going on my Dad had retired. Quite a bit of the info is new to me. Wonderfiul site, brings back a lot memories for me, I can remember Gapp & Roush coming to Dragway Park in Cayuga Ontario and the car was always in pieces, it was almost like a reality show watching them bring the car out of the transporter and assmeble in front of the fans man those were the days!